As I begin writing this, Dave, WA8WV is trying hard to work A61AJ on 80 meters. 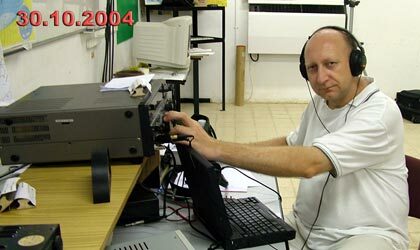 He and I are in the final 3 hours of the 2004 CQWW Phone Contest operating with a special callsign - 4X0WV from beautiful Reut, IIsrael, located halfway between Tel-Aviv and Jerusalem, near Modiin. This is the first time we have operated together as a multi - single operation during a contest. And of couse, this is the first time we have operated together at a contest from a DX location. We are operating 4X0WV from the 4X4REM club station hereat about 300m above sea level at this station which is actually a bunker which is actually a bunker with concrete walls. This is just part of life in Israel. But this is a great contest location with a Kenwood TS-950S, Yaesu FL-2100B P.A., 3-element yagi for HF and delta loops for 40+80m. Of couse, our stay here is more pleasant and our access to the station is made possible only because of our good friend Slava, 4Z5MU (also UT4UN ex: UB5UWG, RZ5UWG, UK5UAP). Slava makessure we have everything and the station is in top shape. 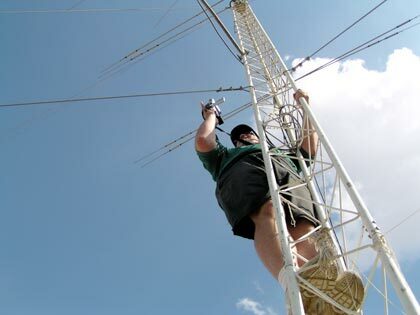 He ven erected a 160m antenna for us to make a couple of multipliers on top band. Reut means "city of friendship" and Slava and the other HAMs in this area sure live up to that meaning. I feel at home here. You see, this is my second trip to 4X and my second time operating CQWW. 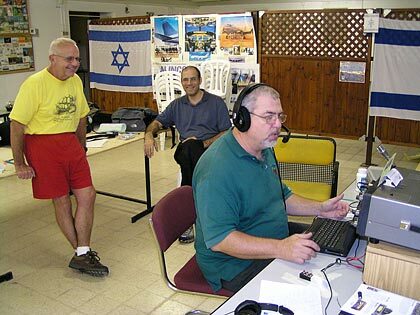 Last year, in the 2003 CQWW Phone Contest, I operated only 17 of 48 hours and made about 1200 QSO's. This year, 2004, I decided to return to 4X for CQWW from the 4X4REM station. Iguess I enjoyed Slava and the 4X4REM stationtoo much last year! Only this time, I wanted to operate the entire 48 hours. dave, WA8WV is the perfect "partner" for this multi-single operation. 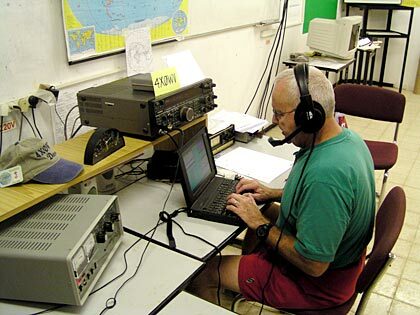 We worked together at the 15meter position at W4MYA's M/M Contest station in Virginia. To operate from Bob's (MYA) great 15 meter stationwas quite an experience itself but Dave and I are not used to being DX and having such large pile-ups on us during a contest. Hooray! Dave just worked the A61AJ for a new multiplier on 80 meters and we pass 4,1 million points. This has been a memorable weekend. We have met some of the 4X HAMs again this year. 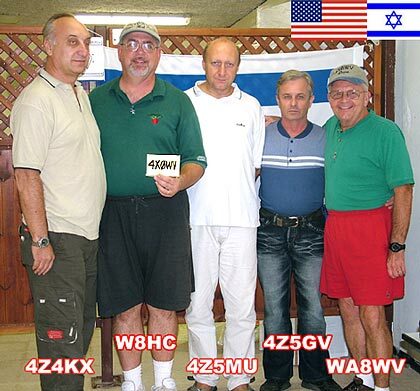 Mark, 4Z4KX and Dim, 4Z5GV stopped by for an eyball QSO here at the 4X0WV "bunker". I met Mark and Dim last year and am happy to call them friends, no-brothers in this wonderful hobby of amateur radio. I also had the pleasure to meet Rich, 4X1DA. Rich lives nearby in Modi'in and stopped by Sunday evening to meet us in person. 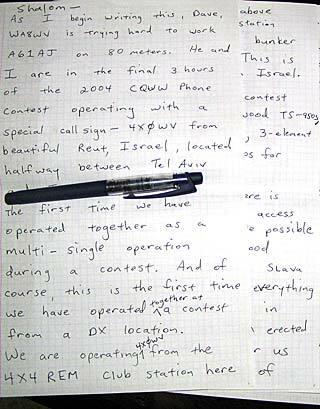 I had QSO'd whith him during the Contest. I look forward to seeing Rich again. In the morning my XYL Stephanie, Dave's wife Mary, and the others in ourtravel party will pick me and Dave up and we will Start our "official" Holyland tour spending 10 more days traveling in Israel. lake Kinneret ( Sea of Galilee), Megiddo ( Armageddon) , Golan, Jerusalem, Dead Sea, Eilat,Beit Shean. the experience of the Contest and the many wonderful 4X friends that have been a part of this trip. I hope to return to 4X !